Andy Vige, president of Machine Specialty and Manufacturing, Louisiana, couldn't find a new machine tool that could take the punishment that one of his 20-year-old Warner & Swasey lathes could. He'd been buying used 1SCs, 2SCs, and 3SCs for years, then driving them hard to make pipe pressure fittings and flanges for the oil industry. The iron in them was still good but the original controls were not. 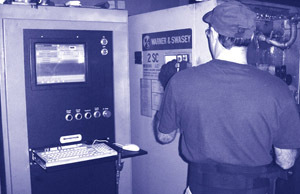 The aging, hardware-based CNCs on the lathes had become obsolete, and it was starting to cost the company plenty$8,500 per day in machine downtimes, Vige estimated. "When a motion board goes, it takes weeks to repair or replace them, and frequently the original control company can't help us at all," Vige said. "When a machine goes down and you get behind 300-400 pieces of flange that you would normally sell during the day, you feel it." The solution Vige found was so successful that 18 months later, he has now transformed 24 lathesalmost every CNC machine he ownsand improved cycle time productivity by 30%. He did it without buying a single new machine and, in most cases, without buying new motors or drives. Vige chose MDSI's OpenCNC software CNC. Read how OpenCNC helped this oil and gas industry manufacturer survive and thrive during a two-year price war.